Are you looking for an easy way to make your existing WordPress site mobile-friendly, without sacrificing your current design? No problem! You can do that with the WPtouch plugin. Our WPtouch review will show you how this plugin can help you create a beautiful site that looks amazing on any device. Why Should Your Site Be Mobile-Friendly? Making sure your site works well and looks gorgeous on mobile devices might have been a nice-to-have feature 5 or 10 years ago, but today it’s necessary for every single site on the web. According to Marketing Land, mobile devices account for 65% of digital media time, with desktops becoming secondary. Today, over half of all internet traffic is from mobile devices like smartphones and tablets. And mobile traffic continues to grow every year. If your site isn’t mobile-friendly, you’re missing out on all that traffic — and it’s only going to get worse as time goes on. There are a couple of popular options when it comes to making your site look good on all devices. Responsive design. A responsive design detects the size of the screen each visitor is using, and adjusts the design to best fit their screen. Many WordPress sites use responsive themes. Separate mobile site. Websites with separate mobile sites detect when a visitor is on a mobile device and redirect them to a separate site (usually on a subdomain, such as m.wikipedia.org). Using a responsive design is a popular method for many sites because you only need to maintain 1 website. However, a responsive design may load more slowly since it needs to adjust the design depending on the device it detects. Having an entirely separate mobile site creates more work for the website owner, since 2 sites need to be maintained and updated. But, if your desktop and mobile users have very different goals and needs, this may be an ideal solution. 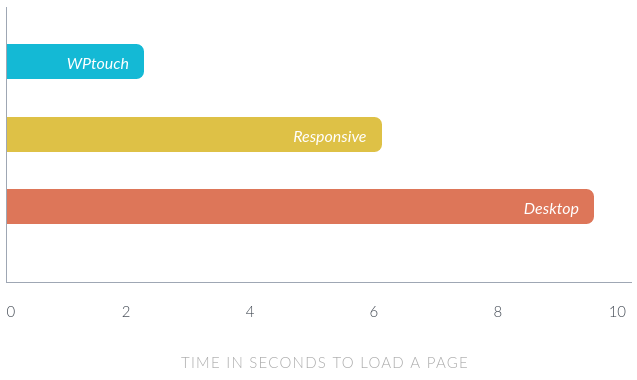 Also, you can optimize your mobile site to load much more quickly than your desktop version. WPtouch is a WordPress plugin that makes your WordPress website mobile-friendly with just a few clicks. The plugin is recommended by Google and it instantly creates a mobile-friendly version of your site that passes the Google Mobile test. The free version of the plugin is available to download from the WordPress repository. The pro version includes several themes and useful addons. WPtouch is really the best of both worlds when it comes to responsive design vs. separate desktop and mobile sites. WPtouch creates a simple mobile version of your website automatically, without having to use a subdomain or separate URL. It leaves the desktop version of your site completely intact, while pulling all the data from your site to create an elegant mobile version. The mobile version of your site can be completely customized with separate themes and settings, without affecting your main site. Why Use WPtouch Instead of a Responsive Theme? If you’ve been using a WordPress theme that’s not responsive or mobile-friendly, you may have some reservations about switching your theme completely. For one, if you really like the look of your current theme, you may not want to change the appearance of your site entirely just to make it mobile-friendly. Switching themes can be a daunting process with a lot of work involved. When switching themes, you can lose some of your saved settings; your menus and widgets may disappear or be messed up, theme-specific shortcodes won’t work anymore, and so much more. See more information about these issues in the article What Happens When You Switch Your WordPress Theme? WPtouch may also be much faster than a responsive theme. Having a faster-loading site can help to boost your search engine rankings. After installing and activating the plugin, navigate to WPtouch » Settings to set up your mobile site. This WordPress plugin will automatically pull your site information (including the site title and language) from your WordPress settings, but you can adjust them here, if needed. 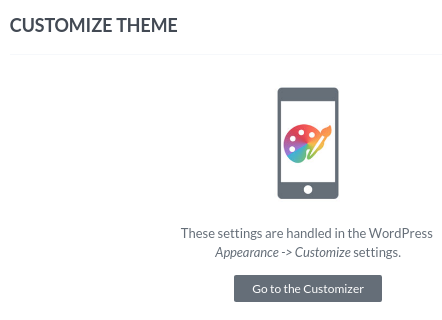 The theme customizer works just like the Appearance » Customize settings for your regular WordPress site, allowing you to change your site icon, colors, typography, widgets, and more, specifically for your mobile site. 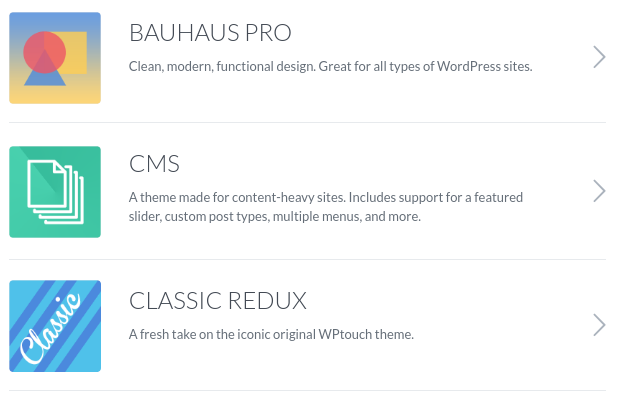 Additionally, WPtouch includes access to 7 more themes. WPtouch is suited for websites of all sizes and budgets. The plugin offers a free version you can install from WordPress.org. The free version lets you transform your regular desktop website into a responsive website. With the pro version, you get a wide variety of enhanced themes for blogs, businesses, and WooCommerce retailers. You’ll also get extensions that offer advanced web font controls, add rich advertising options, and more. The pricing starts at $79, which gives you a single site license. With a Go Pro Plus plan, you can activate 2 websites and you get access to 4 themes and 6 extensions. The Go Pro Plus plan costs you $109. Having a mobile-friendly site is crucial now that mobile devices are so popular. While modern responsive themes are easier to find than ever, you may not want to switch from your old non-responsive theme. Or, you may prefer having a very fast version of your website for mobile users. If so, we recommend using WPtouch. It’s an easy way to create a fast-loading, mobile-friendly version of your site without affecting the design of your desktop site.